The Mad Professor is looking for you to aid in his plans. Click here to play! Bring the monster to life and reap the rich rewards! Mad Professor is a spine-tinglingly good slot that is played across 5 reels and 9 pay lines; activate more lines for greater chances of winning! The Mad Professor is Wild, obviously, and can become any other symbol or logo except Scatters. Land all five on an active pay line for an incredible 4,000 coins. Scattered Monsters will help you win cash by appearing anywhere on the reels, while landing three or more will also trigger the bonus round. If you are in the mood for a jackpot win, then take a shot at the Rapid Fire Jackpot for a few thousand dollars worth of winnings. Will you help the Mad Professor bring the creature to life? Find out today at this brilliant jackpot slot! The Monster is Scattered and can show up anywhere on the reels in order to earn payouts. Two or more will always win, and up to 125 coins can be won on each spin. 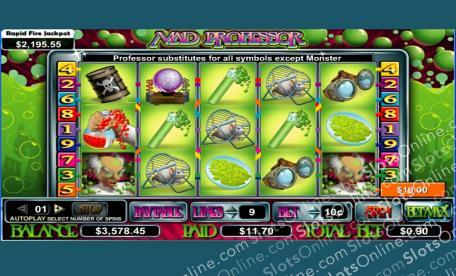 The Professor is Wild and can be subbed for any other symbol on the reels except Scatters. If you manage all five on an active pay line you'll be rewarded with 4000 times your initial stake. Land three or more Scattered Monsters to trigger the Bring The Monster Alive bonus feature, where you can win cash for selecting the correct monster liquid.